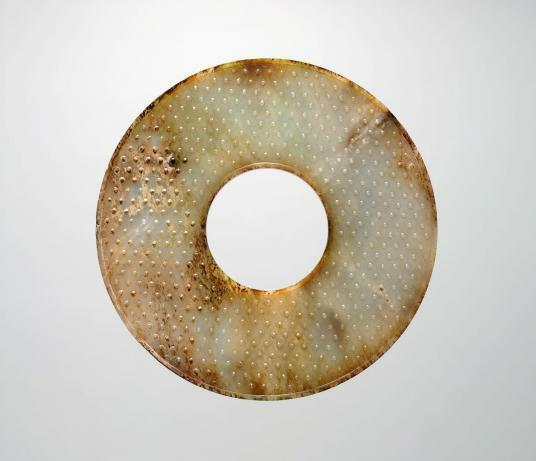 Large jade disk, Chinese, Zhou dynasty, 4th century BCE. Clouded, translucent grayish-green nephrite with variegated light brown markings on one side and large areas of dark brown and grass-green on the other. Harvard Art Museums/Arthur M. Sackler Museum, Bequest of Grenville L. Winthrop, 1943.50.649. Melissa Moy, consultative curator for Chinese ceramics, will give this gallery talk. This talk is offered in conjunction with the recent publication of Early Chinese Jades in the Harvard Art Museums by Jenny So, which is now available in the Harvard Art Museums shop.